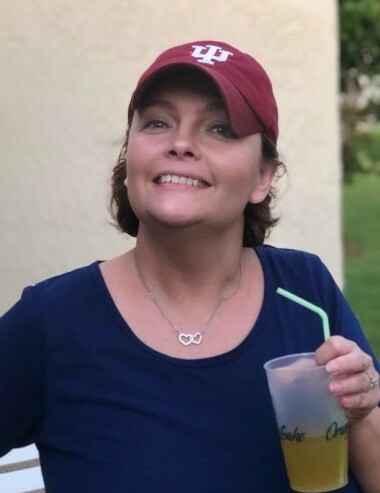 Misty Dawn (Chapman) Sublette, 44, of Spencer, went to her heavenly home on Monday, April 8, 2019 while listening to her favorite music and surrounded by family. Misty was born in Bloomington, Indiana on March 30, 1975 to Richard L. and Sharron (Ridgway) Chapman. Misty was a loving person who cherished her friends and family, especially her children, Nolyn and Kierra. Misty was the 1993 Owen County Fair Queen and graduated with honors that same year from Owen Valley High School. Misty once worked for the Owen County Prosecutor's Office, World Arts in Spencer and really enjoyed being the current director for the Tivoli Theater. Misty was a lifetime member of the V.F.W. Auxiliary #1405, was past president for the Owen Valley Choir Boosters and served on the Board of Directors for the Spencer Chamber of Commerce. Misty loved the Florida beaches and being a hard worker. She will be truly missed by all who knew her. Misty is survived by her children, her husband, Jeremy Sublette, parents, Mike and Sharron Barger, siblings, Leanne and husband David Latour of Maryville, Tennessee, Rick J. Chapman of Iuka, Illinois, mother-in-law, Robin Sublette, sister-in-law, Lisa "Shelly" and husband Jammy Robertson, and several aunts, uncles, nieces, nephews, cousins, and her corgi Pixie. Misty was preceded in death by her father, Rick, grandparents, Clifford R. and Alene Ridgway, Anna Chapman, and aunt, Linda Franklin. Visitation will be 4:00 PM until 8:00 PM, Thursday, April 11, 2019 and again 10:00 AM until 11:00 AM, Friday, all at the Tivoli Theater, 24 North Washington Street, Spencer. Funeral services will be Friday, April 12, 2019 at 11:00 AM, at the Tivoli Theater. Pastor Bill Grandi will officiate. In lieu of flowers, donations may be made to the Tivoli Theater. Services in care of West & Parrish & Pedigo Funeral Home in Spencer. Online condolences may be sent to the family at www.westparrishpedigo.com.